ColorBox Pigment Petal Point Option Pad 8 Colors - CLEARSNAP-ColorBox Petal Point Pigment pad. Option pads feature removable color pads within each pad for expanded versatility. Ideal for creating various color spectrum and direct-to-paper techniques. Also easy to clean and re-ink. 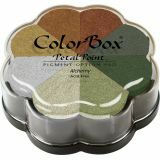 ColorBox pigment pads are water based and formulated to stamp on absorbent papers. Slow drying inks are rich, thick, fade resistant, non-bleeding, acid free and archival. The ink surface is raised for optimum results on any size stamp. ASTM D4236 approved. Non-toxic. Includes 8 colors. Size of each color pad: approximately 2x1-1/2in. Overall measurements: 4-5/8x1-5/8in. Made in USA.